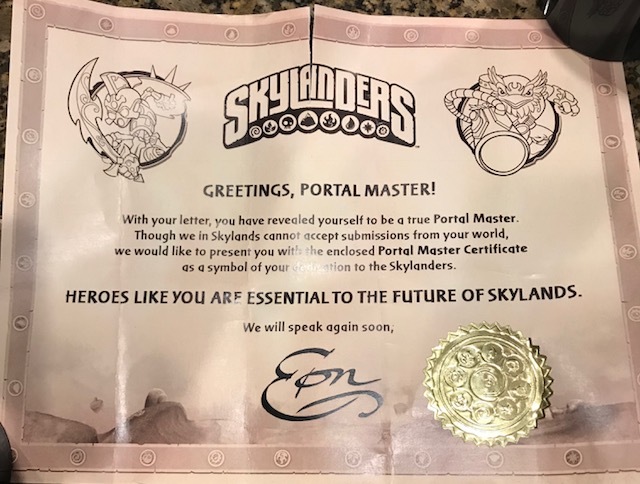 Over a month ago B-man designed 3 new Skylanders. He also wrote a letter to the engineers. He explained the Skylanders to them - their powers and accessories and worlds. He asked them to make the Skylanders and send him the prototypes. He even looked up the address to send it to. We learned how to address and envelope. Of course, I had to add a little something. I put his envelope in a larger envelope and included a letter of my own. I translated his letter since his writing can be a little illegible. And we mailed it off. Everyday, B-man checked the mail. Everyday he asked "How much longer?" I tried to explain that prototypes take a long time to create. And I wondered if he would get a reply at all. Then Friday afternoon, a little box arrived. This is genius and makes my momma heart happy! 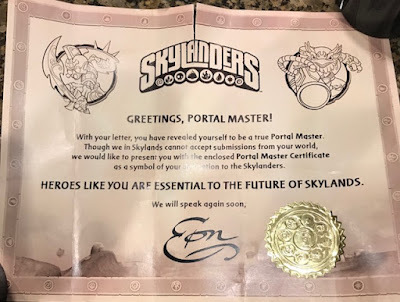 "Though we in Skylands cannot accept submissions from your world..."
B is over the moon! The certificate is now in B's jar of prized possessions. I love creativity and this is a prime example. They know their customers and how to make them happy. And their mommas too! Well done, Skylanders!